Was this shoot specifically for the album or actually for a magazine and then used on the LP? Peter Ashworth: “I shot them 2 or 3 times, I believe this was the first and was done specifically for the LP”. Did the band style themselves or was it someone else? 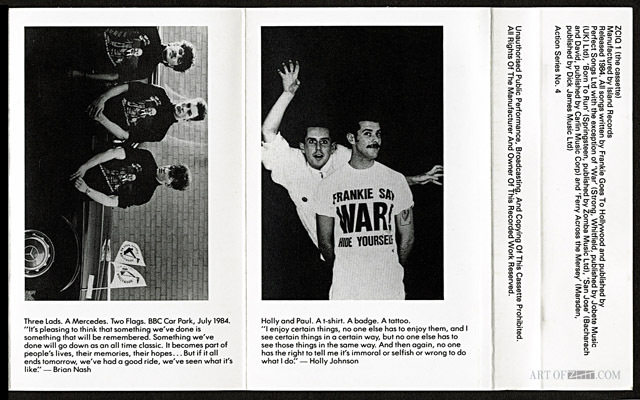 Peter Ashworth: “Looking at the pics and trying to remember I would say they were styled but I do not remember offhand the name of the stylist, possibly sorted by Paul Morley”. Whose idea was the jungle / garden of eden theme and was this meant to represent the pleasuredome? Peter Ashworth: “Paul wanted a jungle of some sort, I built it over a week or so”. 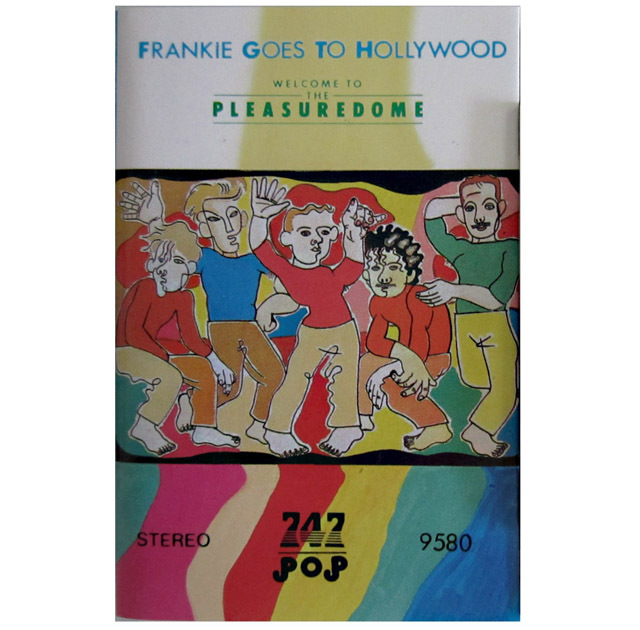 artist: Frankie Goes To Hollywood title: Welcome To The Pleasuredome format: Cassette design: XLZTT illustration: Lo Cole photography: Anton Corbijn / Peter Ashworth / Peter Brown cat. no: ZCIQ 1 date: 29/10/84 art of notes: Peter Ashworth’s band photo was substituted for Lo Cole’s illustration as the front cover for the cassette and CD editions although it was featured inside. The merchandise was included with a tear-off order form as part of the inlay on initial versions. 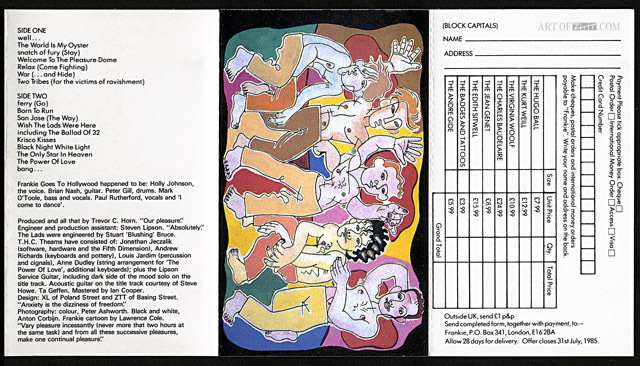 The Italian issue was a double cassette version in a card slipcase and in Saudi Arabia the cartoon cover image had the band’s bare torsos covered up (see end of gallery). This cassette also had a completely different track order to all others although this is probably a bootleg. My cassette didn’t have an edit of Annihilation! Has that edit turned up anywhere else, do you know? I’ve amended this entry as I was getting confused with the compact disc version which contained the Two Tribes mix. As far as I know it has never turned up anywhere else and the master hasn’t been located either, there was also a foreign version of the cassette that contained a different mix of Annihilation with more synths but I need to dig deep to find the specifics of that, that may have been a cunning fan mix masquerading as a lost original by an Alt Board member. Aah, that makes more sense. I’ve got the original CD version, and that did include Annihilation – was the same as the 12″ as far as I recall, but I wouldn’t be surprised if there were some slightly louder hi-hats or similar that I hadn’t noticed. I’ll dig it out later and compare. 30 years on and there are *still* mixes and edits that I haven’t heard!